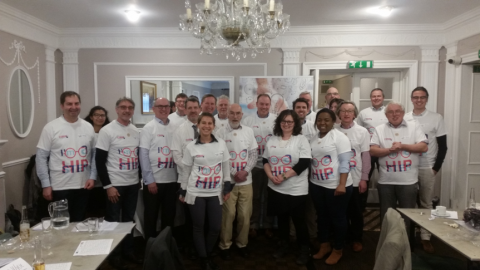 The Health Innovation Programme (HIP) is a comprehensive business support programme designed for healthcare and life science businesses at various stages of growth. It offers expert led workshops that help business owners polish their proposition, write a compelling business plan, navigate the NHS landscape and find funding sources. Among the innovations demonstrated at the event were a company app encouraging mental wellbeing in young adults through shared stories; a medic alert system, based on augmented reality technology, for people with autism or dementia; a device to prevent treatment disruption associated with accidental catheter removal; and a novel display to aid rapid clinical decision making based on large and complex patient datasets. AutonoME: which enables adults with learning disabilities to scan a QR code on household items with any smart device and it plays a video of how to use it. getUbetter: a suite of smart apps to help people self-manage back, ankle, shoulder and knee injuries. Say It app: a pronunciation app which was initially designed for foreign students but is now being used in speech therapy and clinical settings. Xim: has developed Lifelight which is able to measure patient vital signs in 60 seconds using just the camera built-in to smartphones, tablets or computers. Renovos: is developing nanoclay-gels, which when injected into the site of fracture or bone injury will accelerate healing through a localised release of therapeutic agents. SETsquared, the world’s number one university business incubator, joined forces with four Academic Health Science Networks in the South of England in 2014 to set up the revolutionary programme that could see more effective and better value healthcare technologies benefitting patients quicker than ever.